The Prime Minister of England (W. E. Gladstone) and the “Prime Minister” of the Baptists (C. H. Spurgeon) were similar in many ways. Gladstone was known as “The Grand Ol’ Man”; Spurgeon was called “The Gov’nor.” Of Gladstone it was said, “He was religious, and his religion was the secret of his power.” Both were men of principle, prayer, and belief in God. Gladstone was educated at Eton and Oxford and became a Conservative Member of Parliament for Newark. His first important speech called for the emancipation of slaves. He became leader of the Liberal Party in 1867 and Prime Minister four times between 1868 and 1894. 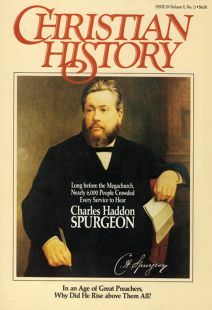 Both Moody and Spurgeon were stocky and bearded. Both looked physically weary until they began preaching, when their faces became transfigured. Both could use humor and pathos to good effect. Both founded colleges, and both men began their Christian service among children. They both had a deep experience of the Holy Spirit. On arriving in England for the first time, in 1867, Moody made straight for the Tabernacle and sat in the gallery, drinking in all he heard. Back home, asked if he had seen this or that cathedral he said, “No, but I’ve heard Spurgeon!” He only wished he could have taken the gallery seat home with him. Spurgeon paid more than one visit to Ashley Down, Bristol, to talk with Müller, that “heavenly—minded man,” about his orphanage. He was astounded by Müller’s stories of living by faith, waiting for God to answer the needs of the orphans in response to his prayers. Spurgeon met several times with Müller and with Hudson Taylor, the missionary to China, at Mentone, in the south of France. In 1875 Müller preached at Spurgeon’s Thursday night service, and it was “a sermon long to be remembered,” commented the Prince of Preachers. Spurgeon once said that if he could change bodies with anyone it would be with George Müller—for time and eternity. They often spent whole days together, stimulating each other’s faith by discussing the unfailing promises of God. Perhaps Spurgeon was influenced more by Müller than Müller was by Spurgeon. In 1867, Spurgeon was offered Â£20,000 to start an orphanage. He suggested the donor give it to George Müller instead. She insisted Spurgeon keep the gift, however, and so Spurgeon launched new homes patterned largely upon Müller’s. The Seventh Earl of Shaftesbury was the best—loved benefactor and politician of the nineteenth century. Tireless and compassionate on behalf of the poor and oppressed, he earned the title, “The Poor Man’s Earl.” He greatly improved the lot of women and children in mines and factories, besides advocating foreign missions. Although Shaftesbury was thirty—three years Spurgeon’s senior, they were firm friends. Both suffered criticism and bouts of depression. Shaftesbury declared that a half—hour’s conversation with Spurgeon always raised his spirits. They corresponded frequently and met at Spurgeon’s London home and at Mentone, in the south of France. Shaftesbury would stay after tea to join in family prayers. Spurgeon described Shaftesbury as “a real nobleman and a man of God.” Shaftesbury became president of a mission associated with Spurgeon’s Tabernacle that ministered to London’s costermongers [street vendors], a large group of people dear to Spurgeon. Shaftesbury chaired Spurgeon’s 50th birthday celebrations in the Tabernacle, and Spurgeon was present at Shaftesbury’s 80th birthday. John Ruskin was educated at Christ Church, Oxford and four years later published volume one of Modern Painters (ultimately five volumes over seventeen years), which brought him to prominence as an art critic. A later work, The Seven Lamps of Architecture, encouraged a Gothic revival. In spite of their educational differences, Ruskin and Spurgeon shared social concerns, and they were firm friends. Ruskin regularly attended Spurgeon’s Surrey Gardens Music Hall services, and when Spurgeon was ill he visited him with gifts of pictures. Ruskin gave Spurgeon a complete set of Modern Painters which the preacher annotated and frequently quoted. Letters and visits were exchanged over the years, and when The Metropolitan Tabernacle was being built, Ruskin contributed £100, a considerable sum in those days. The two would often talk of God’s providence and sovereignty. Ruskin once told a dramatic example of divine intervention in which some children’s lives were saved by a vision of their dead mother. Spurgeon used the anecdote when lecturing to his students. Spurgeon also provided Ruskin with a satisfactory explanation of the death of the physical body and the continued existence of the soul. William Booth was converted, like Spurgeon, in his teens. Both became workers for the Lord within days of their new birth.